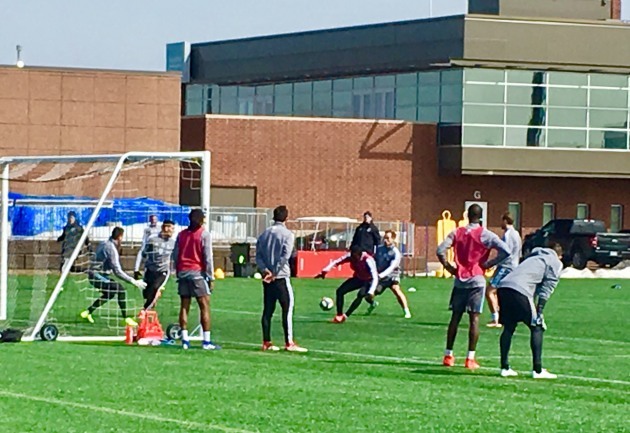 United went to work Tuesday preparing for Saturday’s game at New England with defender Romain Metanire back from duty with his Madagascar national team – and they did so outside for the first time this winter/spring. They trained on the National Sports Center’s turf field to get ready for a game on turf Saturday and did so under a warm sun but in chilly morning air. Can the opening of outdoor Allianz Field be that far behind? Coach Adrian Heath supervised Tuesday after he had a tugged a stocking cap tight down over his head, turned his coat color up against his neck. He wore gloves, too. Darwin Quintero, Romario Ibarra and Jan Gregus are due back with the team on Tuesday. Francisco Calvo and Rasmus Schuller will either meet the team near Boston on Friday or in Blaine on Thursday. He also sounded like a guy still contemplating lineup changes after his team fell behind 2-0 in the first half at Los Angeles. He said he won’t make any decisions until he’s sure all players away on international duty return healthy and ready to play. Heath also said he’s still planning on veteran Kevin Molino’s return in time for the home opener April 13, but not before. Molino is on his way back from knee surgery and hasn’t played since early last season. Heath said another two or three players will go down to Madison this weekend for game while the team travels to play at New England.